Animonda Vom Feinsten Neutered Cat is specially formulated for neutered cats, who are more hungry yet use less energy due to hormonal changes. 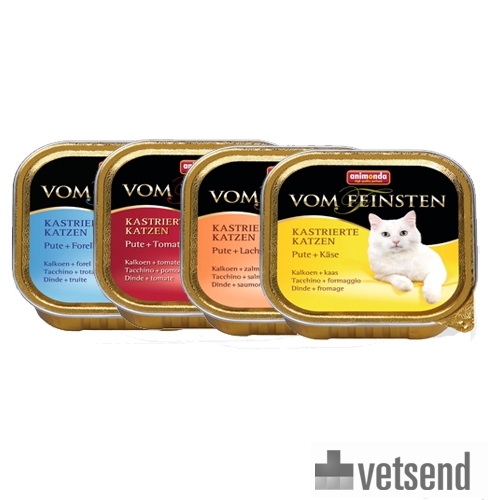 Animonda Vom Feinsten Neutered Cat is specially formulated for neutered cats, who are, due to their hormonal changes, more hungry yet use less energy. Neutering changes the cat's hormones. Energy requirements decrease but appetite increases. This increases the risk of obesity considerably. The highly digestible protein from turkey muscle has a low fat content, helping your cat to maintain a healthy weight. There are four flavours available, all containing turkey. Turkey & Cheese: Turkey (53%), stock, cheese (4%), calcium carbonate, sodium chloride. Turkey & Trout: Turkey (44%), stock, trout (7.5%), salmon (7.5%), calcium carbonate, sodium chloride. Turkey & Salmon: Turkey (53%), stock, salmon (7.5%), trout (7.5%), calcium carbonate, sodium chloride. Turkey & Tomato: Turkey (53%), stock, tomatoes (4%), calcium carbonate, sodium chloride. Have you used Animonda Vom Feinsten Neutered Cat before? Let us know what you think about this product. I went looking for this online when I couldn't get it from my previous supplier because the cats really love it. You can see it's mostly meat and it smells very good! This brand has been a feature in my house for a couple of years now, since I discovered it from a breeder.